CHICAGO—The Neighborhood Writing Alliance (NWA) announces “I Always Like Plenty of Napkins,” the Winter 2011 issue of the Journal of Ordinary Thought. This food-themed issue features prose and poetry from Albany Park, Uptown, Chicago Lawn, Bronzeville, the Near West Side, Humboldt Park, and St. Leonard’s House. Photographs of Chicago’s food culture, taken by DePaul University students under the guidance of professor and photographer Jason Reblando, accompany the writing. and writing by over 60 NWA writers. NWA writers will present their work on Tuesday, March 15 from 6-8 p.m.
at the Jane Addams Hull House Museum Residents’ Dining Hall (800 S. Halsted). Admission is free, and complimentary copies of “I Always Like Plenty of Napkins” will be available. The Neighborhood Writing Alliance is a Chicago-based not-for-profit that runs writing workshops for adults in low-income Chicago neighborhoods and publishes pieces from those workshops in its quarterly, award-winning publication, the Journal of Ordinary Thought. NWA presents the writers and their work in 25–30 events and readings each year. NWA workshops are free and open to adults of all levels of writing experience. From left, Max Florin, Fannie Rosen, Dora Evans and Josephine Cammarata were among the final six unidentified victims of the Triangle Waist Company factory fire of 1911, which killed 146 and influenced building codes, labor laws and politics in the years that followed. In the Cemetery of the Evergreens on the border of Brooklyn and Queens, there is a haunting stone monument to the garment workers who died in the Triangle shirtwaist factory fire of 1911 but were never identified. It contains the bas-relief figure of a kneeling woman, her head bowed, seemingly mourning not only the deaths, but also the fact that those buried below were so badly charred that relatives could not recognize them. Yana Paskova for The New York Times: Michael Hirsch at Calvary Cemetery in Queens. Victims of the 1911 Triangle shirtwaist factory fire are buried there. Almost a century after the fire, the five women and one man, all buried in coffins under the Evergreens monument, remained unknown to the public at large, though relatives and descendants knew that a loved one had never returned from the burning blouse factory. Now those six have been identified, largely through the persistence of a researcher, Michael Hirsch, who became obsessed with learning all he could about the victims after he discovered that one of those killed, Lizzie Adler, a 24-year-old greenhorn from Romania, had lived on his block in the East Village. And so, for the first time, at the centennial commemoration of the fire on March 25 outside the building in Greenwich Village where the Triangle Waist Company occupied the eighth, ninth and 10th floors, the names of all 146 dead will finally be read. The fire was a wrenching event in New York’s history, one that had a profound influence on building codes, labor laws, politics and the beginning of the New Deal two decades later. Among the most anguishing aspects was the memory of the more than 50 young immigrant women and men who were forced to leap from the high floors to escape the inferno. However, many of the 146 victims — 129 women and 17 men — burned to death in the loft building, at Washington Place and Greene Street, and had no telltale jewelry or clothing to help identify them. The day the six unidentified victims were buried was the culmination of the city’s outpouring of grief; hundreds of thousands of New Yorkers turned out in a driving rain for a symbolic funeral procession sponsored by labor unions and other organizations, while hundreds of thousands more watched from the sidewalks. “We consider his list to be the best ever produced on the question,” said Curtis Lyons, director of the Kheel Center for Labor-Management Documentation and Archives at Cornell University, which holds one of the most thorough repositories about the Triangle fire. Workers United, the garment workers’ union, and David Von Drehle, who wrote “Triangle: The Fire That Changed America,” a 2003 history of the fire, said they also regarded Mr. Hirsch’s list as the most authoritative. Descendants of those who perished, like a great-granddaughter of one 33-year-old victim, Maria Lauletti, were heartened by the news, though no one interviewed had yet made a decision whether to exhume bodies from the Evergreens cemetery and attempt a DNA match. No New York City agencies and no newspapers at the time produced a complete list of the dead, Mr. Hirsch said. The most thorough list — 140 names — was compiled by Mr. Von Drehle when he wrote his book, and that was largely based on names plucked from accounts in four contemporary newspapers. The obscurity of their names is evidence of the times, when lives were lived quietly and people were forced by economic and familial circumstances to swiftly move on from tragedies — with no Facebook or reality television cameras to record their every step and thought. Mr. Hirsch, 50, an amateur genealogist and historian who was hired as a co-producer of the coming HBO documentary “Triangle: Remembering the Fire,” undertook an exhaustive search lasting more than four years. He returned to the microfilms of mainstream daily newspapers overlooked by researchers before him and to ethnic publications that he asked to have translated, like the Yiddish-language Jewish Daily Forward and Il Giornale Italiano. He estimates that he consulted 32 different newspapers. He looked for articles about people who, in the weeks after the fire, claimed that their relatives were still missing. He then matched what he discovered with census records, death and burial certificates, marriage licenses, and reports kept by unions and charities about funeral and “relief” payments made to the families of the dead. Lastly, he sought out the descendants of three of the unidentified to confirm that the names he found were still mourned as Triangle victims. Mr. Hirsch began his quest modestly by trying to confirm existing lists. He found that they contained misspelled names, names of those who had actually survived and of those who had not worked at the factory. He was not surprised, given the bureaucratic fumbling and hurried journalism that often follows tumultuous disasters. He also learned that a name of one identified victim had been omitted. He found an article bypassed by earlier compilers in The New York Times from March 31, 1911, about someone named Jacob Dashefsky, who had come forward six days after the fire to say that his sister Bessie, 25, a Russian immigrant, had not returned home. Her body was identified through dental records and barely missed being buried at the funeral for the unidentified on April 5, 1911. That finding convinced him that there were others who had been omitted for similar reasons. He was looking for the monument for Isabella Tortorelli, 17, but instead found a family monument whose Italian inscription spoke of “due sorelle” — two sisters — who perished in the fire. Mr. Hirsch had never seen the name of Isabella’s older sister, Maria Giuseppa Lauletti, on any list before. He checked with the Calvary office and was told that her body was not in the grave. He located her granddaughter, Mrs. Hacker, in Arizona, who told him that the family had never been able to single out Ms. Lauletti’s body among the unidentified bodies, suggesting that she was probably buried at Evergreens. She also informed him that Ms. Lauletti had been an immigrant from Sicily and the mother of five children, four of whom were put in an orphanage after the fire. A version of this article appeared in print on February 21, 2011, on page A13 of the New York edition. Julia Stein compiled a bibliography of Triangle related poetry, literature and literary criticism. How important were race-based voting blocks in this recent mayoral election? What is your vision for Chicago with Emanuel slated to be the next mayor? Why do you think most Chicago voters (more than 800,000 Chicagoans) stayed home rather than going to the polls? What can we do to better engage and mobilize the public for local elections? How will or won’t Emanuel’s mayorship mirror the statewide and national influence of the Daley administration? Rahm Won, But who has the Vision we Need? If you need a sign interpreter or require other arrangements to fully participate, please call 312.422.5580. For parking locations near the facility, please visit Chicago Parking Map.com. Tom Morello performs at the Capitol in Madison, WI. I’ve played hundreds of protests. I’ve marched on dozens of picket lines. I’ve strummed my guitar at innumerable demonstrations. I’ve been arrested more times than I’m willing to put in print in support of striking workers. But I thought now is the time to take a break. I have a 16-month-old son crawling around on the floor and another baby boy about to be born any day now, so I decided to curtail the traveling, the protesting, the rocking. So I flew to Chicago with Wayne Kramer (of the legendary MC5) only to find that all the flights to Madison had been cancelled due to a big winter storm. But neither rain, nor sleet, nor snow, nor dark of night can keep The Nightwatchman from his appointed task. My good friend and fellow musician from Libertyville, Illinois, Ike Reilly, picked us up at the airport and together with our small crew of rabble-rousers we began the precarious journey up I-90 through the storm. Cars and trucks were piled up in the ditch along the roadside, but with fortitude and constant reminders from elder statesman Wayne Kramer that “We’re in no hurry here. Slow down, brother,” we made it safely to Madison. Upon arrival, we linked up with the Boston band Street Dogs and Tim McIlrath from Rise Against, all sturdy union supporters. We had a great meeting with representatives of the AFL-CIO to make plans for the following day. They have been one of the unions spearheading these historic protests but I sensed that they were somewhat nervous about me staying “on message.” Perhaps they had read stories about riots at Rage Against the Machine shows, or maybe because I was decked out head-to-toe in my Industrial Workers of the World gear. Anyway, I was eager to get to the Capitol building and into the action. Global capitalism in the age of electronics and the attendant neoliberal policies have created a huge and widening gap between wealth and poverty across the world. Repression of all opposition to neocolonial states whose political systems serve global capitalism has for decades succeeded in maintaining the status quo. The current crisis of global capitalism – a consequence of the transformation from production based on electro-mechanics to one based on electronics – is threatening the capitalist relations of production based on the exploitation of wage labor. The capitalists in the advanced countries are squeezing their own workers in an effort to escape the crisis. However, the devastation brought about by neoliberal policies on workers in the neocolonies has been much more severe. The social revolutions that have recently occurred in Latin American countries (e.g Venezuela, Bolivia, and Ecuador) are a consequence of this world economic transformation that is taking place before our eyes. The Tunisian and Egyptian upheavals that overthrew two vicious dictators who were allied with global capitalism and neoliberal policies through the U.S. imperial project, are but the two most recent examples of the same process. The main features of the Latin American political transformation are rather clear. They are anti-imperialist, but not anti-capitalist. These are nationalist regimes that are trying to solve economic, social, and political contradictions within global capitalism. The participation of all sectors of society in the Tunisian and Egyptian upheavals indicates the nationalist character of those upheavals. They also have a pan-Arab nationalist character that has no counterpart in the Latin American examples (i.e., no Pan-Latin American character to the extent of the Pan-Arab). This is critical, especially as the upheavals spread to other parts of the Arab world. This stage of the revolutionary process is different from the previous stage where colonies fought against direct colonialism under the leadership of the national bourgeoisie. The revolutions against direct colonialism fitted the needs of global capital so long as a national bourgeoisie dependent on neo-imperialism led them. Even though this stage of the revolutionary process has begun as all-class nationalism, it cannot be sustained under conditions of crisis in global capitalism caused by the epoch-making transformations in production. The outstanding feature of the struggle today is that there is no longer two paths. No matter the ideological veneers – that struggle must turn against private property and for some form of communist reconstruction. This is the reason we see the idea presented by the ruling class that what is needed is to get rid of the dictators and corruption and everything will be all right. This is the reason why the “liberal” wing of the national bourgeoisie suddenly appears on the stage in every neocolony. An entire new epoch is emerging. Today, the bellies are the determining factor. The polarization of wealth and poverty is creating tensions that have inevitably broken the chain at its weakest links (e.g. Tunisia and Egypt). Given all the general factors – liberation with capitalism simply won’t work as a base for social liberation. Since there is no going back, the emerging of class interests will compel the process to move to the next stage – direct struggle against private property in the form of nationalization (the reversal of privatization) and ultimately, the distribution of the social product according to need, regardless of ability to pay for the necessities of life. Humanity is living through dangerous times. It is a time when revolutionaries fully expect the capitalists to fight to the death for the survival of private property in one form or another. The danger lies in that revolutionary parties over the past half-century (with few exceptions) have been devastated. They have been physically liquidated or made peace with the class enemy. They have been replaced by “civil society” organizations who advocate peaceful change within the system while vehemently opposing a communist resolution to the crisis that humanity is facing. That solution is the public ownership of the means of production and distribution according to need. The proletariat, the large mass of humanity, is facing a vicious enemy with no organization and program that is capable of carrying the revolutionary process to its conclusion. What is required of revolutionaries is to determine the line of march and build organizations capable of seeing that revolutionary process reaches its ultimate conclusion. For the first time an objective communist class is forming to become the foundation for a communist political movement. Globalization creates this new class everywhere. Global unity is the condition of its national emancipation. The League extends its hand of comradeship around the globe. Here are a few selections from Rally, Comrades! that give perspective on the world events unfolding today. 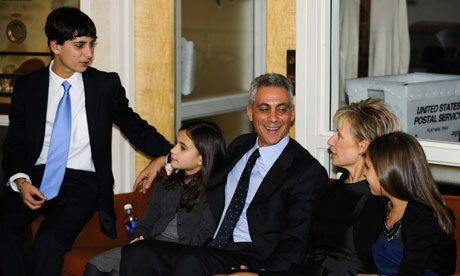 Rahm Emanuel sits with family members son Zach, daughter Leah, wife Amy Rule, and daughter Ilana as he awaits election return at his election night rally in Chicago, Illinois. Photograph: Tannen Maury/EPARahm Emanuel, the notoriously combative former top aide to President Barack Obama, has become the new mayor of Chicago. With 88% of precincts reporting in America’s third largest city, Emanuel had a commanding leading of 55%; a long way ahead of his nearest rival, former Chicago schools president Gery Chico, on 24%. Emanuel needed to win the race by 50% or more to avoid a run-off election and capture City Hall at his first try. He has now done that easily, despite the election for the mayor’s office once being seen as the most open and competitive in a generation. “Thank you Chicago for this humbling victory,” a smiling Emanuel told supporters at his victory rally in the city. “You sure know how to make a guy feel at home. “It is easy to find differences, but we can never allow them to become divisions. Tonight we are moving forward in the only way we truly can. Together. As one city, with one future. Chicago’s political machinery is notorious within American politics and this last race was the first in 64 years not to feature an incumbent candidate. Since 1989 the spot was held by Emanuel’s predecessor Richard M. Daley, who never faced a serious challenge and was known as “King Richard”. But Emanuel’s seeming outsider status ignored the well-funded campaign that he ran with his war chest dwarfing those of his rivals. It also showed the benefits of Emanuel’s time as President Barack Obama’s chief-of-staff in Washington where he gained national prominence on the back of an image as a tough-talking and foul-mouthed operative who rarely took prisoners. That reputation was hardly a disadvantage in Chicago where rough and tumble politics define the local political landscape. Indeed the main threat to Emanuel’s victory during the campaign came not from any candidate at the ballot box but from a protracted legal fight aimed at proving he did not have the right residency qualifications for the race. Emanuel eventually triumphed in court but only after an appeal. Emanuel, who is a former Congressman from the city and a native Chicagoan, has often said that the chance to become mayor was a “dream job” and the only reason he would leave the White House. But now, faced with the realities of wielding civic power in one of America’s biggest cities, he may be wondering at his choice of words. Across America local governments are facing deep budget cuts in the wake of the Great Recession. Chicago is no exception. City finances are stretched and ways of raising fresh revenue are being squeezed. There is a projected shortfall in the city budget of some one billion dollars and an unemployment rate of almost 9%. Chicago’s police force is also stretched and short of funds and there is also a serious crime problem, especially in the city’s traditionally black South Side neighbourhoods. Rahm “Voldemort” Emanuel — ballet dancer, corporate hack, and Democratic-party politico — has won the 2011 Chicago mayoral race. He skirted a bid to oust him from the ballot on a technicality, and outraised funds against his combined five mayoral opponents by a 5-to-1 ratio, playing off positive vibes as “Obama’s guy”. Emanuel’s political career is rife with controversy, conflicts of interests, and corporate kowtowing. He worked as a consultant to Richard M. Daley (whom he’s succeeding as mayor) while illegally consulting for bond firms which did business with the city. He joined the Bill Clinton campaign and served as arm-twister-in-chief to marshall Democrats’ votes in 1993 to approve the controversial NAFTA treaty. Emanuel called Clinton’s welfare “reform” efforts “the most successful social policy experiment in a generation” (meanwhile, child poverty in the USA has climbed to 22% by 2010). He left the Clinton administration to become an investment banker and vice-chair of the Chicago Housing Authority, during which time he contributed to the CHA’s controversial Plan for Transformation, demolishing public housing structures without replacing them. Emanuel ran for Congress in 2002, vying for the seat previously held by Rod Blagojevich, and won the seat courtesy of the illegal efforts of city water workers whose boss plead guilty to bribery charges. In Congress, Emanuel orchestrated opposition against progressive Democratic candidates, admitted to a pro-Iraq-war stance even without evidence, and accumulated a massive bankroll as the largest recipient among U.S. House representatives of donations from the financial services industry. Emanuel was plucked from Congress in 2008 to serve as President Obama’s White House Chief of Staff, during which time he tried to stymie Obama’s modest health care reform plan, attacked liberal Democrats critical of Obama’s lukewarm efforts, and criticized organized labor. In his bid for Mayor of Chicago, Emanuel falsely claimed high results from Chicago charter schools, received considerable campaign contributions from the financial sector, and has ties to the firm that won Chicago’s controversial parking meter lease. Emanuel all but echoes Daley’s opposition to antiwar and grassroots activists, privatization of Chicago public resources, and ties to big business. And with Chicago still America’s largest city without mayoral term limits, Chicago could well face more of the same policies from The Fifth Floor for quite some time.